What is grit? How does being “gritty” translate into achievement and how can we teach our piano students to persevere over the long-term despite setbacks? 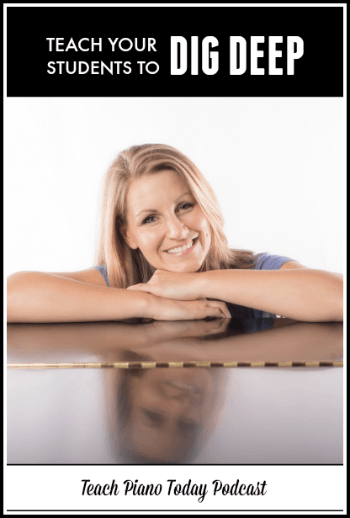 If you’ve ever asked yourself these questions – or, if this subject piques your interest, then today’s TeachPianoToday podcast will fascinate you. Do You Have Gritty Piano Students? What role does innate ability play, and how important is talent? What is Growth Mindset and how can it change the way we teach children? You can actually take the “Grit test” and explore more information on grit on the Duckworth lab site. The original TEDtalk with Lauren’s mentor, Angela Duckworth on Grit (viewed 6.2 million times!) Can be found here. To listen to today’s podcast, click on the player below, or visit our iTunes page to download it to your smartphone or iPod and take us on-the-go!